The industry’s workforce is changing as experienced engineers and electricians retire and are not being replaced with individuals with the same experience level or an equivalent number of workers. The average man-hour costs are increasing across the industry. Capital and operational expenditures are under more scrutiny. Budgets are being tightened to deal with a tougher economy, putting equipment space at a premium in facilities across many industries that require higher power density from their limited floor space. Both industrial and regulatory standards for safety are increasing as the effects of electrical hazards become better understood and discussed. For these and other reasons it is time to reevaluate medium voltage switchgear applications. Traditionally, medium voltage switchgear in the United States has been Air Insulated Switchgear (AIS), meaning that the principal method for achieving dielectric stability is sufficient air gaps between phase conductors. In metal-enclosed fused switches, the cabinets are completely open and rely on an air gap to separate the phases and prevent cross-over to the grounded enclosure sheet metal. In metal-clad switchgear, the requirement for an insulating cover around each conductor was introduced [Figure 1]. However, the widespread use of bus differential protection schemes shows the design community’s lack of trust in the current insulation system’s ability to prevent phase-to-phase faults. There has been some investigation of Gas Insulated Switchgear (GIS) types in the ANSI market over the past decade to address dielectric concerns and explore the benefits of reduced footprint and maintenance. But concerns surrounding regulatory oversight of SF6 gas have made many designers hesitant to use GIS in lower voltage ranges (5kV and 15kV), where there are several alternatives. Therefore, with fewer options at these lower medium voltage levels, it is challenging to address the need for increased equipment protection, smaller footprint requirements and a higher level of safety. The latest design of medium voltage switchgear addresses these issues through an innovative insulation system called Solid Insulated Switchgear (SIS). This system uses molded epoxy insulation as the principal source of dielectric strength. A key benefit of SIS is that it allows for a decreased air gap between the phase conductors, which reduces equipment size. It can also eliminate exposed live parts when used throughout the switchgear’s interior. This insulation can be further improved by adding a conductive layer to the outside of the insulating layer, which, when set to ground potential, creates a ground shield around each phase of the switchgear. This enhanced version is called a Shielded Solid Insulated System (2SIS). This innovative additional step means that not only are there no exposed live parts, but every interior portion of the switchgear is at ground potential. The ground layer minimizes phase-to-phase interaction, reduces the likelihood of arc flash and helps to protect the insulating material itself. 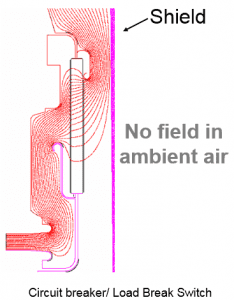 The ground shield behaves like a Faraday cage, minimizing the propagation of electric field into the ambient areas of the switchgear. This helps prevent insulation break down phenomena such as partial discharge and tracking [Figure 2]. 2SIS offers a number of additional benefits. One benefit is that footprint can be drastically reduced. Traditional metal-clad switchgear has a standard section width of 36 inches, and depths and heights averageing 92 inches and 95 inches, respectively. Whereas 2SIS can obtain section widths less than 15 inches and depths as small as 36 inches. When comparing similar lineups of metal-clad and 2SIS, the footprint can be reduced by as much as 60 percent. Additionally, the decreased footprint helps to produce switchgear that can be front-accessible only in design. This allows the switchgear to be placed against walls and in corners of electrical rooms, which can preserve valuable and costly facility space. Part of this benefit is derived from the ability of 2SIS to offer a wider variety of circuit breaker continuous current ratings. Traditional metal-clad switchgear only offers 1200A and above ratings, but 2SIS switchgear offers circuit breakers with ratings of 200A, 600A and 1200A. This allows designers to select breakers which more accurately reflect the loads they are feeding and reduce cost. Shielded Solid Insulation also increases the reliability of medium voltage switchgear. The ground shield paired with the molded epoxy insulation acts to increase the life expectancy of the insulation itself. By protecting not just the conductor, but the insulation, the switchgear life expectancy is increased. Standard industry hazards such as tools and sheet metal left on bussing during maintenance, or the intrusion of rodents and vermin into live switchgear have traditionally resulted in damage to the switchgear, requiring equipment replacement. With 2SIS the switchgear is better protected from these common switchgear-killing scenarios. With a longer expected lifecycle comes a decreased requirement for maintenance. By pairing the shielded solid insulation system with a fixed vacuum circuit breaker, many of the failure points of metal-clad switchgear are removed, and yearly maintenance cycles can be pushed out to a 10-year interval. All of these features produce a switchgear design that is more reliable and longer lasting. 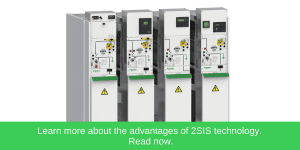 2SIS also addresses safety by reducing the likelihood of arc flash incidents. By separating each phase by two insulating epoxy layers, two ground shields and an air gap, the probability of any kind of phase-to-phase interaction is minimized. Also, by ensuring that all parts on the interior of the switchgear are at ground potential, there is little to no room for adverse current dissipation to occur. Additionally, with reduced maintenance requirements, personnel are in and around the switchgear less, thereby reducing exposure to medium voltage power. Through safety interlocks and intuitive operation, inadvertent or ignorant misuse of the switchgear can be prevented, adding a level of safety by design. Looking to address issues of modern electrical design, Shielded Solid Insulated System switchgear provides a variety of benefits. To learn more about the advantages of 2SIS technology, download the whitepaper. Interested in learning more about Schneider Electric’s medium voltage switchgear offer? Click here to visit our website.